The modern North Carolina Medical Board (NCMB) began as the North Carolina State Board of Medical Examiners, created by the General Assembly in 1859 "in order to properly regulate the practice of medicine and surgery for the benefit and protection of the people of North Carolina." 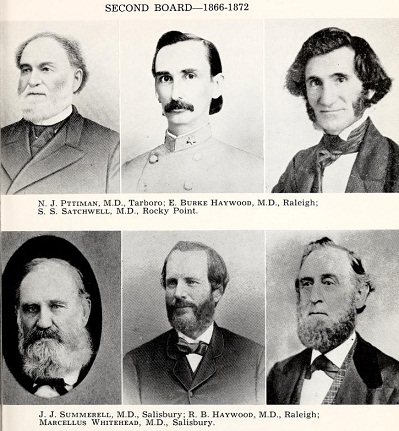 The board originally consisted of seven members, all of whom were physicians whose names were provided by the North Carolina Medical Society. The board selected its own officers, met annually, kept its records open for public inspection, and published the names of newly licensed physicians in Raleigh newspapers. From the beginning, a major duty of the NCMB has been the examination of applicants for a license to practice medicine in the state. In the mid-1800s any person at least 21 years of age and of good moral character could apply to be examined. Physicians who had practiced prior to 1859 were in most cases automatically licensed. The board had the right to rescind the licenses of persons guilty of immoral conduct. Any individual practicing medicine without a license was prohibited from suing to recover charges for medical services rendered, but there was no legal penalty. The first medical license issued by the NCMB was received by Lucius C. Coke of Palmyra (Martin County) on 6 June 1859. Annie Lowrie Alexander of Charlotte became the first woman to be a licensed practicing physician in the state in 1887, having been certified by the Maryland Board of Medical Examiners two years earlier. In 1921 the General Assembly passed a law specifying that only licensees of the NCMB were allowed to register and practice in the state. The legislature also defined what legally constituted the practice of medicine, repealed the statute permitting unlicensed individuals to practice by registering with a clerk of a superior court under oath of having practiced in the state before 1885, and detailed specific reasons and procedures for the revocation of licenses. Among the reasons for revocation were engaging in grossly immoral conduct, performing criminal abortions, obtaining a medical license by fraudulent means, using narcotics, misrepresenting medical skills or practice, violating the rules and regulations of the state board, and any other unprofessional conduct. Only the board could revoke or restore a license, although persons affected could appeal the board's decision to the superior court. In the final decades of the twentieth century, minor additions to the law involving the NCMB were made, including charging fees for licenses, requiring the biennial registration of physicians, and regulating the use of physician assistants. The NCMB also kept up with changing medical law, such as the monumental 1973 U.S. Supreme Court decision in Roe v. Wade legalizing abortion. In 1981 the board was reorganized to consist of eight members, seven of them licensed physicians chosen by the North Carolina Medical Society and named by the governor. The eighth member, from outside the health profession, was appointed directly by the governor. In 1993 four more board members were added-two public members, one at-large member, and one physician assistant or nurse practitioner. All four were selected by the governor. In 2000 the NCMB's proposal for increased medical education was adopted, requiring licensed physicians to accrue 150 hours of continuing education over a three-year period beginning in 2001. The board has also been a significant contributor to medical licensure on a national scale, with four members serving as president of the Federation of State Medical Boards of the United States. The NCMB newsletter has been a leading professional publication since its establishment in 1996, featuring timely articles, essays, and reports on medical issues. The board's website, also begun in 1996, has earned high marks as one of the most informative medical licensure sites in the nation. Ivan M. Procter and Dorothy Long, One Hundred Year History of the North Carolina State Board of Medical Examiners, 1859-1959 (1959). North Carolina Medical Board official website: http://www.ncmedboard.org/. "Second Board 1866-1872" from Ivan M. Procter and Dorothy Long, One Hundred Year History of the North Carolina State Board of Medical Examiners, 1859-1959 (1959).